When you visit some pages on Facebook, you’ll see a call to action at the top. It’s up in the upper right corner, below the cover photo but above the informational boxes on the sidebar. It’s called the Call to Action button, and there are a lot of options associated with it. Deleting the button, obviously enough, removes the button from your page. If will be a blank spot on your sidebar for any visitor who isn’t an admin of the page. If you’re an admin and you have no button set, you will see a button in place that says “add page button.” Clicking that brings up the same menu that “edit button” does, if you already have a button enabled. You have various options for what your call to action button can do. They fall under different categories. The first option is booking an appointment, with the call to action of Book Now. This button allows you to link up some kind of scheduling app. A user clicking the button will be presented with your appointment scheduler and will be able to book an appointment with your business directly. The available apps include Appointments on Facebook, Google Calendar, a custom website link, HomeAdvisor, MyTime, Microsoft Bookings, Booker, Booking Bug, Setster, and SimplyBook.me. You can also use this form to request that Facebook integrate with another tool you want to use, though this won’t happen immediately. The second option is to contact your company, with six possible calls to action. These calls are Call Now, Send Message, Get Quote, Contact Us, Sign Up, and Send Email. Each has its own set of settings. Call Now allows you to add your company phone number. When a user clicks on the button, they will either be given your phone number – if on the web – or sent to their phone app to initiate a call, if on their phones. Send Message is the primary option mentioned in the title of this blog post. It hooks your business up with Facebook Messenger, allowing any user to message your brand page directly using FB Messenger. More on the specifics of this later. Get Quote allows people to request a quote information from your business. You have three options; TalkLocal, Porch, or a custom form that you can have people fill out and submit. Contact Us is the most basic contact option, and allows you to set a custom website link for users to use to reach out. This can lead to an email address or to a contact page URL. Sign Up is the same as Contact Us, except with different text. You can send people to a custom website link, typically a landing page or a form for the user to fill out. Send Email is a more traditional form of Contact Us, and rather than a website link, you use it to add your email address. When a user clicks or taps on it, they will be taken to whatever their default app is for managing email, like a Gmail link, Outlook, or an email app for their phones. The third option is to educate users about your business, and has two calls to action. These are Watch More and Learn More. Watch More gives you two options. You can either select an existing Facebook video or upload a new one, or you can send people to an external website link where a video is hosted. This can be a YouTube link, or it can be a landing page on your site that includes an embedded video. The second method is generally preferred, so you can change it more easily without needing to change the link on Facebook. The fourth option is direct shopping-related calls to action. You have two here as well; Shop Now and See Offers. Shop Now allows you to send people to a website link, typically your storefront. You can also send people to a shop app you have set up on Facebook. You can read about setting up a storefront on Facebook here. 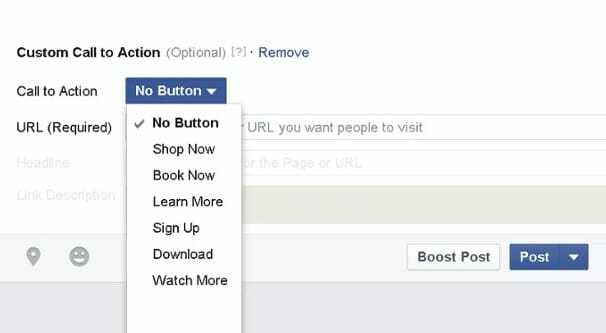 The See Offers option allows you to set up the Offers app for Facebook and link people to it. That app allows you to offer coupons and sales directly to Facebook users, rather than implementing them on your site itself. The fifth option is to get people to download your app or play your game. The two calls to action reflect that, with Use App and Play Game as your two options. Both options allow you to set a website link of your choice, which can be your website with a landing page, a storefront page for Google Play, iTunes, or Amazon, or the website URL for your game on Facebook itself. It’s worth noting that Facebook changes these options occasionally. They may add new calls to action based on testing or requests, and they may add more app integrations upon request for options like appointment scheduling. Be sure to check over your options before assuming all I’ve covered is all there are. If you want to use the Send Message call to action and communicate with your fans via Facebook Messenger, you need to be prepared to communicate with them quickly and appropriately. First of all, if the option does not appear in your call to action options, you may have messaging disabled. Go into your page settings and make sure you’re on the General tab. One of the options will be Messages; click it and make sure “Allow people to contact my Page privately by showing the Message button” is checked. Save your changes if necessary. 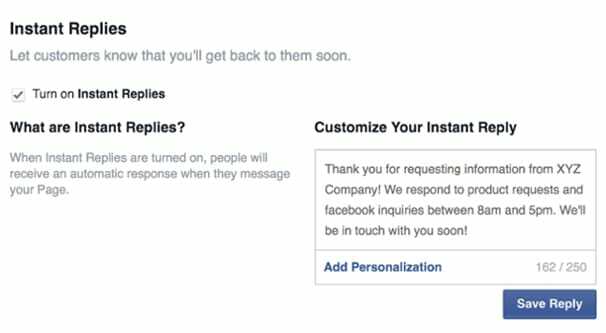 With this option checked, anyone can send a request to your page via Messenger, even if you don’t set the call to action button. The call to action button is simply useful if you want to push the fact that you’re using Messenger. Essentially, if you have messaging enabled, you will always have a Send Message call to action. It will either be next to your existing call to action button, as it is on Moz’s page, or it will be one large blue call to action button on its own, as it is on this page. If you have messaging enabled, you will also have a rating for how quickly you respond to messages. For the Outland Ballroom page I linked above, check out their About section. You see their map, their address with a directions link, their phone number, and then a line about messaging. It says “typically replies within a few hours” with the Send Message link below it. You can have several different ratings, ranging from “within minutes” to “within a day”. As you might expect, a faster response time is better. The better your response time, the more likely people are to try to contact you through that option. Ideally, it will be faster than email and on par with calling your location directly. There are a few quirks to be noted with response times. First of all, it is calculated based on how quickly your page sends an initial, non-automated response to any communication sent to the page. It doesn’t count or calculate any time for messages after that first one. If you set your page status to Away, it will stop calculating at all, and will resume calculation when you set your page to active again. Additionally, Instant Replies do not count towards the response time calculation. I’ll have more to say about Instant Replies and various chatbot options in a moment. Finally, there are some quirks about how messaging works with a page. A page cannot send unsolicited messages to anyone on Facebook. You can only respond to a message sent to your page, or send a message in response to a comment left on your page. You also cannot send messages to people who have blocked the page, nor can you send messages to other pages as your page. Several different page roles can respond to messages, so make sure you have your team set to the appropriate privilege level. Specifically, only admins are allowed to enable or disabled messaging or change the call to action button, while Admins, Editors, and Moderators are all able to send and respond to messages sent to the page. Instant Replies are a sort of placeholder initial message you can enable for your page. When someone sends your page a message, if you have instant replies enabled, they will get an automatic response. Think of it like an Away Message from an instant messenger, or like a “your call is valuable to us and we’ll be with you as soon as possible” hold message for a phone line. You can enable Instant Replies in your page settings. Click on the messaging tab rather than the general tab in your settings, and enable “send instant replies to anyone who messages your page.” You can edit the message and save it from this menu. Instant Replies are not a chatbot. They are one simple message sent once in response to a new message to your page. Any further responses will need to be made by a human. That is, unless you actually use a chatbot. Facebook chatbots started with M, a messenger assistant and experiment. It was pretty good, but required a lot of detailed programming to make it do everything you might want it to do. Unfortunately, as of January of this year, Facebook has closed down M and disabled many of those chatbot features. That said, there are still API hooks for chatbot integrations in messenger, and you can still build a chatbot using a third party service. We covered the various chatbot options you can use over in this article. Should you consider using a chatbot? I think so, if you have need of it. If you don’t get very many messages, you probably don’t need to be paying for a third party bot manager. If you’re a large enough business to have a dedicated customer service team, you probably don’t need a bot either; it can streamline solving some initial problems, but it will need a dedicated employee to manage it and make sure customers are satisfied. No chatbot can fulfill every possible messaged need due to how much is involved with a typical business interaction. To explore what a chatbot can do, you can check out 1-800 Flowers on Facebook. If you click the “send message” button, you see an initial message that says that you can order flowers or talk to support directly within messenger, with a “get started” button. That button will ask the user to authorize the app to harvest some personal information, though, which many users are currently very unlikely to do. After all, Facebook has a very bad recent history with user’s personal information. Essentially, just think about your possible use cases for messenger. If you have a specific task that isn’t handled by one of the other call to action options, AND that task is something that can be handled automatically, AND it’s formulaic enough that a bot can do it – like answering a question or making an order from a short list of products), then you can probably make use of a bot. If you need more human interaction, it’s probably better to just pay an employee to monitor your messages themselves. I just changed from profile to page and the button “Send Message” is not available. What can I do to fix it? I need this button to work and it is not available.